Whilst travelling around several countries, I’ve been afforded the opportunity to take part in some amazing, impromptu experiences. And that’s what has happened in Glenwood, Illinois; a multi-racial town that is both commutable into Chicago but also has unemployment issues. Arriving to stay with friends I met in Moscow last year, I was treated to my first ever visit to a firing range. Firing pistols with a degree of accuracy that I had not believed possible of me was exhilarating; but more followed. My friends are firearm trainers, and as such have a close working relationship with their local Police Department (PD). Michelle described how willing the police are to have the public shadowing them. A Sunday morning text with subsequent phone calls to at-home Police Chief Cook meant that by Monday morning at nine I was at the police station. Officer Gene Shedore, an experienced policeman of twenty plus years standing was to be my guide for the remainder of his shift, approximately five hours away. 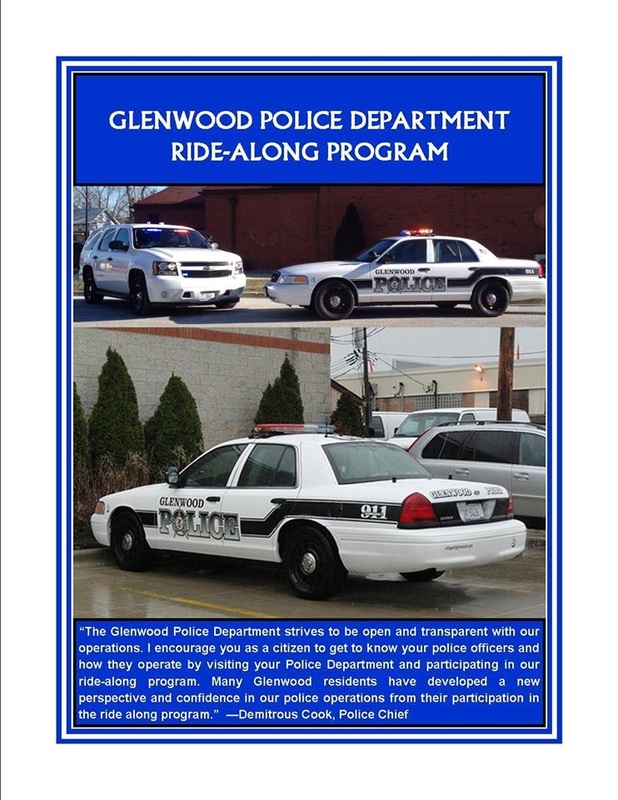 Adorned in a kevlar vest, I was treated to a behind the scenes tour of Glenwood PD. Then a call came in. A 71 year old lady had fallen and was presenting as confused. We left immediately, but Gene decided that lights and sirens were inappropriate: arriving like the cavalry may only add to the distress. On arrival the Fire Department (who seemed to respond to most calls as front line medics), and a private ambulance service were in attendance. We stood down. But before we left the parking lot, we were summoned back to the station; not to deal with one but two callers in person. Both enquires were fraught with a fair amount of anxiety and aggression. The first caller was a 39 year old lady who was concerned for her mother’s welfare. Mom was being cared for by the oldest of five daughters, and the youngest sibling feared neglect was occurring. It was also stated that the eldest daughter had made threats to the rest of the family; and that she was a drug addict. There were also monetary matters to take into account as the youngest daughter had legal control over mom’s financial affairs. Gene asked Fire Chief Welsh to get involved, and he offered advice about issues of neglect. The daughter was passed onto detectives with whom she also spoke. The second enquiry was from an elderly lady who stated that she felt threatened by her neighbour’s dogs. Apparently local by-laws stipulate a maximum of two of each type of pet, and the accused was said to have five dogs. Fire Chief Welsh was again on hand as this was a known incident and he had already referred the case to the Dog Warden. The aggrieved lady was reassured but added she would call 911 every time she felt endangered. Gene reaffirmed this was her right. With both the enquiries dealt with, I believed we were about to resume a quiet Monday morning shift. But wait. The PD transport cash to the bank on behalf of the town council; more commonly referred to as The Village. That was our next task…but not quite. Fire Chief Welsh and PD detectives had agreed to visit the mother of the 39 year old daughter at her apartment. Uniformed officers (and I) were to attend. Whilst the officers and their shadow, along with attending paramedics from the same private ambulance service as before waited in the hallway, the detectives and FD personnel entered. Mom was fine and appeared well cared for. The were no signs of drug usage. Chief Welsh offered some salient advice to the daughter; that advice being that the children needed to talk to one another, not fight; and it was hoped this would be heeded. Back in the car, a report of a 911. Yes…it was the lady with the troublesome dogs. We were supported by one of Gene’s colleagues, Officer Allen, who had attended the previous incident with us. On arrival we were met by the aggrieved lady. The only dog we could hear was her own yapping terrier locked in her house. Once again the lady complained that the neighbour’s dog had aggressively approached the boundary fence, frightening her. Gene summoned me to join him as he spoke with the neighbour. The gentleman was fully appreciative of the situation, and described the actions he had taken to reduce the lady’s fears. These seemed reasonable. But it was ultimately his word against hers; and Gene had not witnessed any incident. As the Dog Warden was involved, we withdrew. Another call came in. An eighteen year old who is a Ward of the State and as such treated as a juvenile, had gone missing. We were in his home area so a search commenced. Based on the description given, Gene quickly spotted a youth that fitted the bill. However, on stopping and politely quizzing the individual who presented ID, it proved not to be the missing lad and the mistaken party was soon on his way. Gene ran a car number on a car cruising slowly around a residential area, but this proved wholly innocent. A call came in from a known gentleman who has mental health issues. His concern was that his thermostat was too loud. As he is a persistent caller, the police trace his calls and the gentleman was not even at home. A regular occurrence. Throughout my four hours on the road, Gene spoke to passing residents; or gave a cheery smile and wave where more appropriate. And those best wishes and gestures were reciprocated in kind. Gene is white, and mostly every person we came across was black (apologies to those that find these descriptions disturbing but that is as it is in America). Race was never an apparent issue for anyone; just mutual respect. People identified Officers they had dealt with using their first name; something I felt ‘humanised’ the police in the face of the public. Gene told me he had worked homicide, vice, children; and as such had seen the worse that policing had to offer. But this has not diminished the love of his job or his desire to serve. He described himself as a pseudo Social Worker; and indeed he is. Although there to uphold the law, the last thing he wants to do is go Policing. A wise head knows problems can sometimes be solved in different ways.